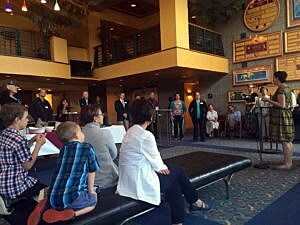 Reception celebrates the growth of Spark!, an arts education program expanding to all grades in Missoula. Spark! officially kicked off its fourth year in Missoula classrooms with a recent reception honoring its teaching artists and welcoming director Jackalynn Snow. Hosted by the Dennis and Phyllis Washington Foundation and Missoula Community Theater, the reception also marked the start of the second full year of Spark! residencies and programs in K-5 classrooms across Missoula County Public Schools, along with the launch of Spark! in middle schools. Coming soon: Spark! in MCPS high schools. Spark! grew out of the Kennedy Center’s Any Given Child program, a nationwide initiative that focuses on ensuring access to diverse arts learning opportunities for all children in its 30 host communities. Board chairman Tom Bensen told the assembled artists, teachers and volunteers that Missoula is by far the smallest community tapped for the Kennedy Center program. Other Any Given Child cities include Austin, Texas; Baltimore, Md. ; Iowa City, Iowa; Fresno, Calif.; Portland, Ore.; and Jacksonville, Fla.
Mike Halligan, Washington Foundation executive director, traced the Spark! program’s roots to Phyllis Washington, who discovered the Kennedy Center’s initiative and asked if there was a way to bring the program to Montana. In Missoula, the prospect of arts inclusion and equality found an eager, welcoming and hardworking team of community leaders, classroom teachers, university professors and teaching artists. The Washington Foundation has provided much of the financial support for Spark! Other partners include MCPS, the city of Missoula, the Missoula Cultural Council, the University of Montana, First Interstate Bank, the Englehardt Foundation, Nick and Robin Checota, and the Kennedy Center. MCPS Superintendent Mark Thane, who has been involved with Spark! from its earliest conceptual days, said that by the end of the 2016-17 school year all of his district’s K-8 teachers will have had a full day of arts integration training. Missoula teachers are using the arts to teach children about currency and place values, about the science of fire and water, about social studies and geography. Thane also lauded the teaching artists who bring dance, music, media arts, visual arts, theater and writing into Missoula classrooms as part of the Spark! program. These residencies and special presentations deepen students’ arts education by giving them significant amounts of time with artists. Last school year, MCPS elementary classrooms hosted 71 residencies, increasing students’ access to arts education by more than 1,000 hours. And those residences came in addition to the trips students took to world-class art exhibits, and to dance, music and theatrical performances. Now, Nick and Robin Checota have donated $50,000 to expand programming to the 1,700 students in MCPS middle schools. That programming will begin this academic year. The University of Montana has been, and will continue to be, a key partner of Spark!, said Stephen Kalm, dean of the College of Liberal and Performing Arts and a founding member of the Spark! governing board. Spark! welcomed a new director in June, when Jackalynn Snow and her family arrived in Missoula. Already, she said, it is clear that “there is something amazing and special about” Missoula’s commitment to arts education. “Spark! is an open door for every child in Missoula to have amazing arts learning experiences,” Snow said. “When I heard about how the Missoula community had joined together for the common purpose of providing quality arts education for every student, I was impressed – and I wanted to be a part of it. For the past two years, Snow worked at an international school in Surabaya, Indonesia, where she was chair of the English department and started a theater arts program. Before the overseas assignment, she spent 10 years teaching English and theater at Billings Skyview, where she directed 25 theater productions. Snow has a master’s degree in arts integration in education from the Creative Pulse program at the University of Montana.